And here we are with the tenth studio album from the Red Hot Chili Peppers. The flawed, yet incredibly admirable I’m With You never strays too far from the traditional course but it does offer the listener a fair share of moments both groovy and (dare we say) graceful. Uncharacteristically devoid of traditional single material, the album is a more straightforward and organic affair favoring warmth in place of inexplicable audacity. Still, the hooks, the bass, the funk, are all thankfully prevalent- but they function more appropriately here as individual pieces of an enjoyable (yet massively overlong) fifty-nine minute entity. 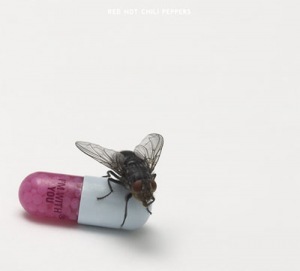 With the exception of “Brendan’s Death Song”, any traces of the band’s previous angst have dissipated- although this should be fairly obvious to Chili Peppers fans that endured the bloated, soulless affair known as Stadium Arcadium. However, I’m With You feels largely content making peace with itself and the listener. It’s a difficult act to sell for any artist, let alone one with a history as volatile as the Chili Peppers. But the band here seems at ease with it’s own evolution. And as a result, this may be the first time Anthony Kiedis has ever sounded genuinely wise on record. Perhaps I was a little hard on the Red Hot Chili Peppers with June’s preview of their single “The Adventures of Rain Dance Maggie”. And while I am no “Rain Dance Maggie” advocate, the band is far from dying; instead, they seem to be living merely on their own terms. And for a band like the Red Hot Chili Peppers, this should come as no surprise. Even more so than on previous releases, band stalwarts, Anthony Kiedis and Flea, are front and center here. Despite the vocal confines of the legendary frontman, there is a comfortable restraint to his lyrics even at their most “freaky styley”- and Flea gets ample opportunities to exercise his fleet-fingered bass lines that exist to purposefully rescue songs from sonic disarray. Much fuss has been made over the replacement of guitarist John Frusciante, mostly due to the band’s previous excursion sans Frusciante- the misunderstood One Hot Minute with Dave Navarro. And while replacement guitarist Josh Klinghoffer is not quite as prominently featured (there are times when he actually seems buried within the mix), he is allotted several moments to shine especially in the album’s first half. Although he could certainly grow to be the full-bodied presence of his predecessor, Klinghoffer is reliably efficient, workmanlike, and far from the distraction that was Navarro. I’m With You is not without it’s fair share of clunkers. But they are often strategically surrounded by energetic stretches of quality. The tracklist structure deserves substantial praise. As far as discernible flow, this is the band’s best arrangement of songs since Californication. The album begins with the dynamite trifecta of “Monarchy of Roses”, “Factory of Faith”, and “Brendan’s Death Song”- three tunes that seamlessly capture galloping rhythm, funk, and pathos. The following tracks, “Ethiopia” and “Annie Wants a Baby” never fully engage like intended, lacking the steadfast direction of earlier tunes. I have already said my piece on “Rain Dance Maggie”- yet I must admit the song is not quite as painfully awkward when taken in the album’s context. “Look Around”, “Did I Let You Know”(with a trumpet solo), and “Goodbye Hooray” liven up the midsection and also feature some of Klinghoffer’s more impressive melodies. I’m With You’s overlength predictably causes it to stumble towards the end. “Police Station” or “Even You Brutus” would have functioned properly as legitimate album closers. Instead, we end with “Meet Me at the Corner” and “Dance, Dance, Dance”- two offerings that are far too slight to end such a polished effort. In particular, the placement of "Dance, Dance, Dance" is a little odd. No strangers to minimalist finales, Californication featured the beautifully quaint "Road Trippin" as it's curtain-dropper, but "Dance" exists somewhere between a campfire singalong and a raucous high-energy dance number. The song really only works when listened to beyond the tracklist. Nevertheless, I'm With You is an immensely rich and polished collection of songs. And if there was ever any real doubt, the Red Hot Chili Peppers are back and not treading water. Whether or not this direction is aimless is really for them to know and us to find out. But when it comes to these guys- isn’t that always the point?